An unforgettable voyage across the reaches of America and the depths of memory, "Red Brick, Black Mountain, White Clay" follows one incredible family to discover a unique craft tradition grounded in America's vast natural landscape. Looking back through the generations, renowned critic Christopher Benfey unearths an ancestry--and an aesthetic--that is quintessentially American. His mother descends from colonial explorers and Quaker craftsmen, who carved new arts from the trackless wilds of the frontier. Benfey's father escaped from Nazi Europe--along with his aunt and uncle, the famed Bauhaus artists Josef and Anni Albers--by fleeing across the Atlantic and finding an eventual haven in the American South. Bricks form the backbone of life in North Carolina's rural Piedmont, where Benfey's mother was raised among centuries-old folk potteries, tobacco farms, and clay pits. Her father, like his father before him, believed in the deep honesty of brick, that men might build good lives with the bricks they laid. Nurtured in this red-clay world of ancient craft and Quaker radicalism, Benfey's mother was poised to set out from home when a tragic romance cracked her young life in two. Salvaging the broken shards of his mother's past and exploring the revitalized folk arts resisting industrialization, Benfey discovers a world brimming with possibility and creativity. Benfey's father had no such foundation in his young life, nor did his aunt and uncle. Exiled artists from Berlin's Bauhaus school, Josef and Anni Albers were offered sanctuary not far from the Piedmont at Black Mountain College. A radical experiment in unifying education and art, Black Mountain made a monumental impact on American culture under Josef's leadership, counting Robert Rauschenberg, John Cage, and Buckminster Fuller among its influential students and teachers. Focusing on the natural world, innovative craftsmanship, and the physical reality of materials, Black Mountain became a home and symbol for an emerging vision of American art. 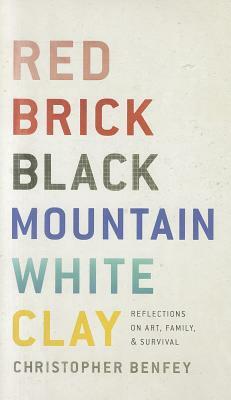 Threading these stories together into a radiant and mesmerizing harmony, "Red Brick, Black Mountain, White Clay" is an extraordinary quest to the heart of America and the origins of its art. CHRISTOPHER BENFEY is Mellon Professor of English at Mount Holyoke College. A frequent contributor to The New York Times Book Review, The New Republic, and The New York Review of Books, he has held fellowships from the Guggenheim Foundation, the National Endowment for the Humanities, and the American Council of Learned Societies. Benfey s most recent book, A Summer of Hummingbirds, won the Christian Gauss Award of Phi Beta Kappa. He lives in Amherst, Massachusetts."